During the Civil War, the Confederacy attempted to use “Cotton Diplomacy” to force Europe’s major industrial nations to enter the war. The strategy was simple–British and French textile mills depended on Southern cotton, and if that cotton was cut off because of the war, it would force the European powers to intervene in the conflict to save their domestic industries. The strategy failed, of course, in spite of the near elimination of Southern cotton from the international market during the war. Today’s map gives a hint as to why. 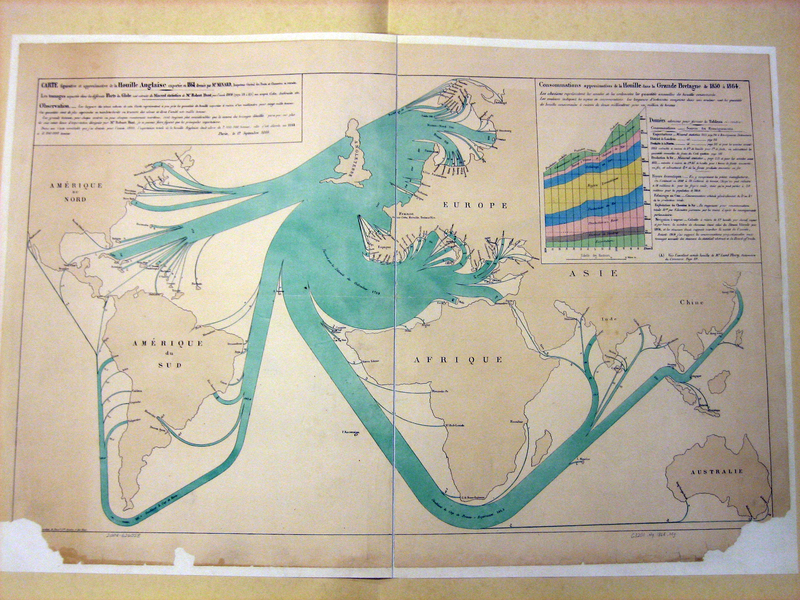 The map above is a curious comparative map of the quantities of cotton and wool imported to Europe in 1858 and 1861. Blue represents cotton and wool from the United States, the orange from British territories in South Asia, and brown from the Levant (the East Mediterranean). Pink represents cotton and wool imported to Britain that was subsequently re-exported to Europe. There is also a small sliver of imports from Brazil, also in a light blue, though the original color may have faded. One millimeter represents 5,000 tons of cotton or wool. Click here or on the picture above to see the map enlarged. In 1861, the Union had not yet implemented its wartime blockade of the South, and cotton and wool could still be exported. Nevertheless, the British were facing continuous demand and worried about the stability of their suppliers. As such, they ramped up production of cotton in India and elsewhere in South Asia, clearly visible on the map. When the South eventually was fully blockaded, it was this South Asian source of cotton, as well as additional new production, that kept Continental textile mills in operation and prevented Cotton Diplomacy from succeeding. In fact, in 1861, re-exports of cotton and wool from Britain to the Continent actually increased. Minard also includes a line chart of cotton and wool production and imports over 30 years. This chart is interesting in its own right, as it shows how the Industrial Revolution and the Cotton Gin dramatically increased the demand for and production of cotton. Click here or on the picture below to see the graph in a larger size. Although this map does not show as stark of a comparison as other Minard maps, it still serves to show a clever framwork for cartographic comparison. This is a post in our continuing “Mondays with Minard” series, exhibiting Charles Joseph Minard’s excellent cartographic handiwork. This map was photographed specifically for use here at Cartographia from the collections of the Library of Congress. Feel free to reproduce the map in any way you wish, but please cite us as the source. Charles Joseph Minard was a master of using simple sizes to indicate relationships. In this map, as with his famous chart of Napoleon’s invasion of Russia, Minard expertly relates the volume of tonnage shipped through European ports and on European rivers to the size of the lines and circles representing them. Minard developed this map from data on port and river tonnage in the mid 1850s. The numbers over each circle are the volume of products shipped in thousands of tons. For this map, Minard includes all ports that carry over 200,000 tons of cargo per year. For the rivers, each millimeter of thickness represents 100,000 tons of shipping. Click here or on the picture above to see a bigger map. The movement of commerce across the continent is presented starkly through the thickness of the rivers and the area of the ports. Britain, a worldwide commercial leader, has Europe’s two largest ports in London and Liverpool. Only Constantinople and Marseilles present any challenge to Britain’s remaining ports for volume of tonnage. Britain, however, has no river shipping listed. Northwestern Europe–the Netherlands, France, and northwestern Germany–have tremendous shipping along their rivers. The Elbe and the Rhine account for a majority of this shipping. With Germany still not unified but with a burgeoning manufacturing sector, all the commercial products had to travel to sea via rivers. Even today, the Dutch port of Rotterdam handles the world’s highest annual shipping tonnage. The Russian Empire, with its vast distances and few railroads, made good use of its navigable rivers to transports goods. Sadly, the area on the map around the mouth of the Volga, in the Caspian Sea, is damaged. Otherwise, we would also know the volume of goods leaving and entering Russia via Central Asia. In France, the Seine itself does not transport a tremendous amount of cargo; but its tributary the Oise carries huge amounts of goods from the manufacturing centers in northern France to the markets of Paris. Similarly, the Rhone carries little international shipping; most of its cargo begins and ends its journey in France. This is the third post in our continuing “Mondays with Minard” series, exhibiting Charles Joseph Minard’s excellent cartographic handiwork. This map was photographed specifically for use here at Cartographia from the collections of the Library of Congress. Feel free to reproduce the map in any way you wish, but please cite us as the source. The original map is in fairly good quality, but I ran the picture through Photoshop to improve the contrast and make the colors more vibrant for the sake of clarity. 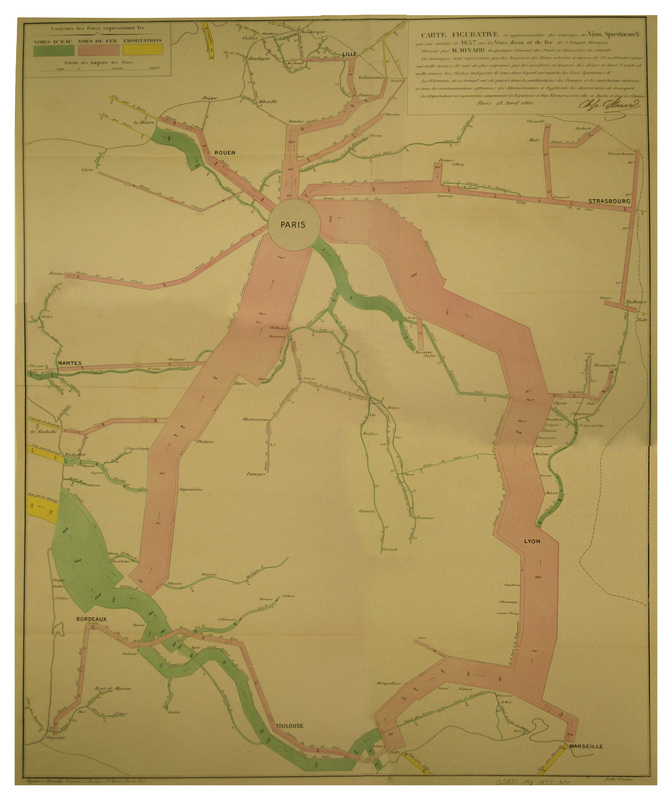 There are few features on this site that have garnered as many positive responses as the works of Charles Joseph Minard, the 19th Century French economic geographer, cartographer, and civil engineer. 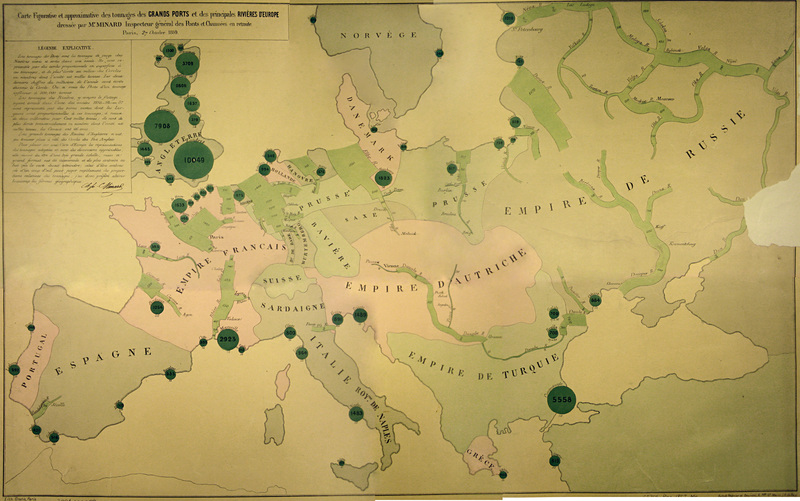 Minard produced dozens of fascinating maps of economic, military, and social trends. 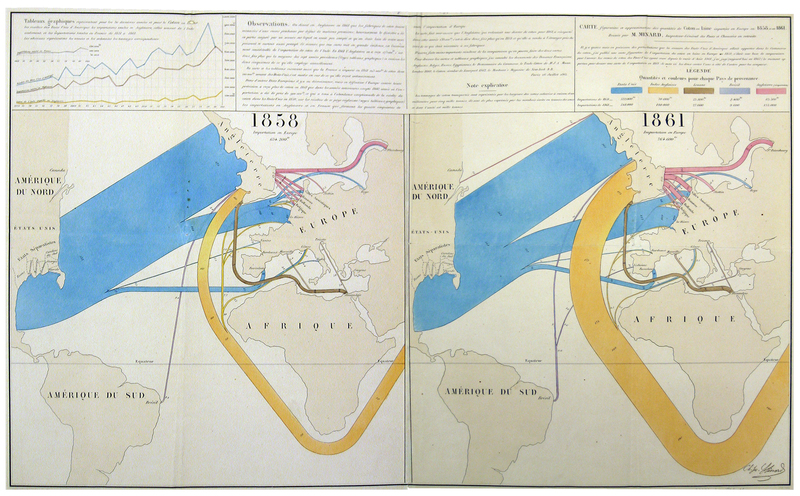 Two of his maps–a chart of Napoleon’s 1812 invasion of Russia, and a map of international immigration in 1858–have previously been featured on this site. Now, I am introducing a weekly feature where, each Monday, I will present another of Minard’s excellent maps. Toward the end of his life, Minard donated a complete set of his maps to the École Nationale des Ponts et Chaussées, the French national academy of bridges and roads, where he had served as the superintendent. As far as I know, this is the only complete collection of Minard’s maps; but several others are held in collections around the world. One relatively small but high-quality collection is held by the Library of Congress, here in Washington, DC. Others have been reproduced in English- and French-language books on thematic mapping. I’ve done my best to draw on as many sources of Minard maps as possible to present them here. Many of the maps that will appear over the next several weeks are not available elsewhere on the Internet. All of them are unequivocably in the public domain, however, so feel free to reproduce and circulate them, though we here at Cartographia would appreciate attribution. Charles Joseph Minard’s most famous work, a chart of Napoleon’s invasion of Russia, immediately impresses the observer with the magnitude of Napoleon’s losses. The quickest of glances shows the dramatic thinning of the line representing the number of men in his army as they succumbed to starvation, enemy combat, and the bitter cold. Minard produced a companion map, shown above, of Hannibal Barca’s invasion of Italy in 218 BC during the Second Punic War, including his famous crossing of the Alps. Minard’s map charts Hannibal’s path from Iberia (Spain), across southern Gaul (France), across the Alps and into Italy. Minard represents the number of men in Hannibal’s army with the thickness of the line showing the army’s path. One millimeter of thickness represents 1,000 men. The Hannibal map, however, is not as striking as the Napoleon map. For one, the numbers of men involved in Hannibal’s invasion are significantly smaller. 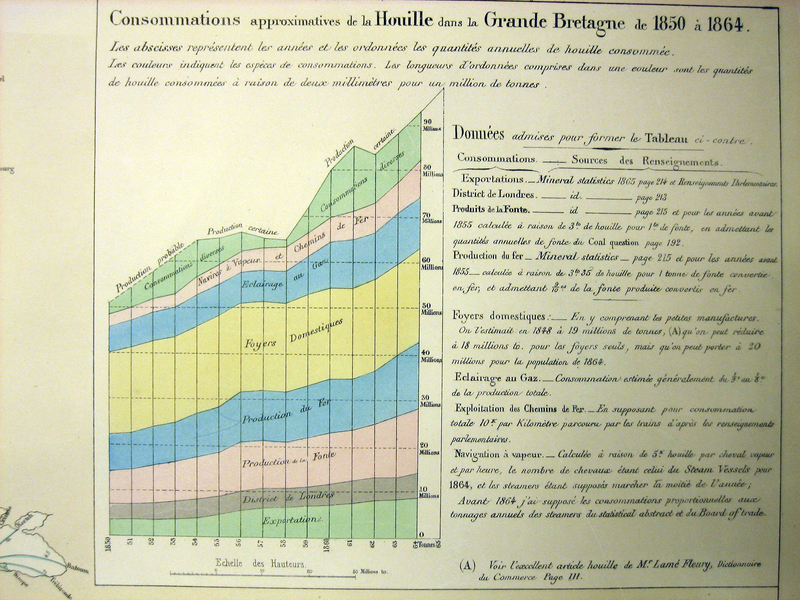 Minard could have exaggerated Hannibal’s losses by increasing the ratio of men to line thickness, but held exactness in too high a regard to attempt such data manipulation. Click here or on the picture above to see the full map. The Punic Wars were fought between Rome and Carthage over control over the Western Mediterranean. The First Punic War, between 264 to 241 BC, was fought over control of Sicily and ended with Roman victory and the defeat of Carthaginian naval power. The Second Punic War, on the other hand, was fought over conflicting spheres of Roman and Carthaginian influence in Spain. Rome declared war on Carthage in 218 BC, and Hannibal set out soon after to invade Italy. Hannibal understood that Carthaginian naval power was weak, and that Rome had to be struck directly in order to guarantee decisive victory. Since he had no means of attacking by sea, he had to strike overland. According to Minard’s sources, Hannibal began his journey with 94,000 men including cavalry, siege engines, and, famously, 36 war elephants. When he arrived at the Pyrenees, the force numbered about 80,000. In the Pyrenees he subdued the local tribes with significant losses. Minard records Hannibal’s army at a strength of 60,000 when it emerged from the mountains, a loss of 25%. An approximate overlay of Hannibal’s route on a modern-day map from Google Earth. Click on the picture to enlarge. Hannibal now marched across the plains of southern Gaul, defeating or negotiating with the local tribes. He only met significant resistance when he tried to cross the Rhone River near modern Avignon. He defeated the opposing tribe, as Minard shows, by sending a detachment upriver and outflanking them. Hannibal then began his crossing of the Alps. To this day, Hannibal’s path across the mountains is debated. 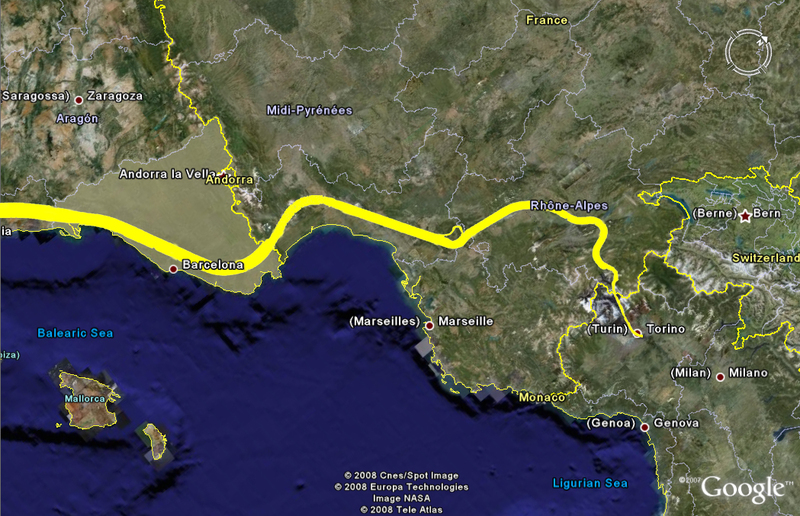 Minard’s legend indicates that he uses the route suggested by French historian Jean-Louis Larauza, though Minard indicates he himself cannot speak to the historical accuracy of this route. Regardless, Minard indicates the severe losses Hannibal’s army experienced during the crossing–46,000 men entered the foothills of the Alps in 218 BC, but only 25,000 emerged. Now in Italy, Hannibal sought to join up with anti-Roman allies in the region, but before he could he had to fight his way through further hostile tribes and local Roman forces. By the time the army crossed the Po River, these engagements dwindled the forces to a stunning 6,000 men. It was these few who would join with the anti-Roman forces in northern Italy to begin the main assault on Roman territory. Hannibal’s crossing of the Alps is generally regarded as a masterpiece of military strategy, but in the crossing Hannibal suffered dramatic losses of men, as well as of his war elephants and, perhaps most importantly, his siege engines. Without these engines, Hannibal would not be able to penetrate the fortifications of Rome itself and force a surrender. Though he ravaged the Italian countryside for several years and won several important battles, he was eventually defeated by the tactics of Quintus Fabius Maximus, who realized he could defeat Hannibal by attacking the one thing he could not replace–his men. He began forcing Hannibal to fight small, costly engagements instead of direct conflicts. These “Fabian” tactics are still used today; we know them as “wars of attrition.” The constant skirmishes caused Hannibal’s limited manpower to dwindle to dangerous levels, and eventually forced his retreat as he still could not receive reinforcements from Carthage. What better way to start the week than with another map by Charles Joseph Minard? Cartographers and students of graphic design generally idolize Minard for his ability to translate large and complicated data sets into easily understandable formats. I have previously covered one of Minard’s other works, but this map is just as interesting and incorporates some of the same principles as his map of Napoleon’s invasion of Russia. This map charts the numbers and destinations of emigrants from Europe, Africa, China, and South Asia for the year 1858. Minard correlates the thickness of each line with the number of emigrants it represents, with one millimeter equalling 1,500 people. He also overlays the exact number of emigrants (in thousands) over the lines themselves. 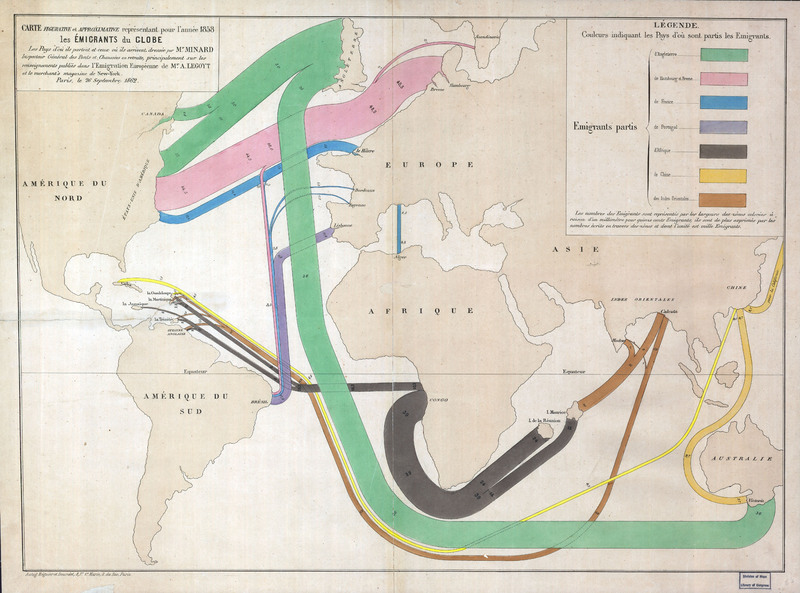 Minard carefully puts divergent lines together and pulls them apart to demonstrate the flow of immigration from major ports in Europe and Asia and toward different final destinations. Finally, Minard also adds a color-coding system to further ease the identification of nationalities on the move, and places a legend in the top-right corner. Click on here or on the picture above to open a large version of the picture. The countries from where they depart and the ones where they arrive, drawn by Mr. Minard, Inspector General of Bridges and Roads in retirement, principally from the public records in “European Emigration” by Mr. A. Legoyt and the Merchant’s Magazine of New York. Colors indicate the countries from where the Emigrants have left. The numbers of Emigrants are represented by the width of the colored zones, with one millimeter representing fifteen hundred Emigrants; they are also expressed by the numbers written across the zones of which the unit is one thousand Emigrants. Some aspects of the map jump out immediately: for instance, the outlines of the continents are fairly inaccurate–especially North America and Australia–and Europe is disproportionaly large. But these inaccuracies don’t seem to diminish the impact of the map. The top left quadrant is dominated by the large numbers of emigrants from Britain and Northern Europe. But note that, according to Minard’s statistics, more Englishmen were emigrating to Australia than to the United States. Also note the relatively small amount of French immigrants to America, especially compared to the large numbers from Northern Europe who faced similar language and cultural barriers. There are small slivers of immigration from France, Northern Europe, and Britain to South America, and slightly more considerable numbers from France to its colony in Algeria. The map also indicates that French immigrants to North America generally departed from Le Havre on the English Channel, whereas Frenchmen destined for South America left from Bayonne or Bordeaux. The map also demonstrates the considerable flow of African labor to European colonies. The thick lines from the Congo region to the Indian Ocean islands of Reunion, a French colony, and Mauritius, a British colony, represent the labor necessary to run the sugar plantations on those islands. There are also thinner lines indicating African labor was still flowing to the Caribbean, to the French sugar islands of Guadeloupe and Martinique, and to the British territories of Jamaica, Trinidad and Tobago, and Guyana. But as the map indicates, three times as many Africans were taken to Mauritius and Reunion as went to both the French and British territories in the Caribbean. Note the lack of African labor traveling to the United States. Although emancipation was still several years away in 1858, the U.S. Congress had banned the import of foreign slaves fifty years before, in 1808. There are similar patterns in the immigration from South Asia. Large numbers of laborers are shown leaving Madras and Calcutta for Mauritius and the Caribbean surgar islands. Minard’s data indicates that although comparable numbers of people departed Madras and Calcutta for Mauritius, most of the laborers departing for the Caribbean departed from Calcutta, with only a tiny number leaving from Madras. Finally, Minard illustrates three strands of Chinese emigration. The first is to Australia, where it joins the large numbers of Britons arriving in Victoria. The second is a thin line around the Cape of Good Hope and across the Atlantic to the Caribbean, mostly to Cuba, but with a tiny offshoot to Guadeloupe. The third line disappears over the edge of the map into the Pacific ocean, toward distant California. This map only represents one year of data, so multiply these statistics over several decades and it is obvious how North America in particular became a continent of immigrants. The map is also designed well enough that, with the exception of knowing the subject of immigration, the data is generally understandable without needing to read the legend. Notes: This map is based on the Library of Congress version accessible here. I ran the picture through Photoshop to lighten it and make the colors a little brighter but I did not alter any of the components of the map itself. And thanks to Mike for the translation!